General view from the north. Original negative captioned: 'Cairnwell Circle near Portlethen Station General View from North July 1902'. General view of cairn. 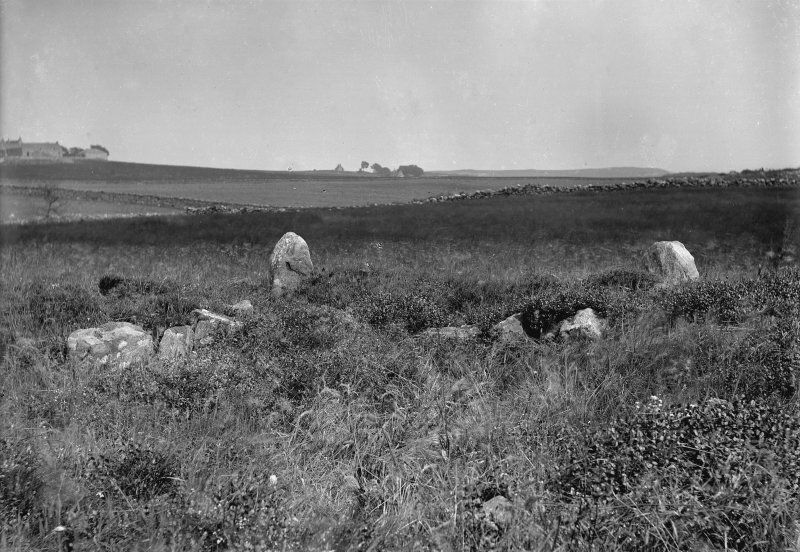 Original negative captioned: 'Stone Circle at Cairnwell, near Portlethen, View from East, Oct 1904'. View of stone setting. 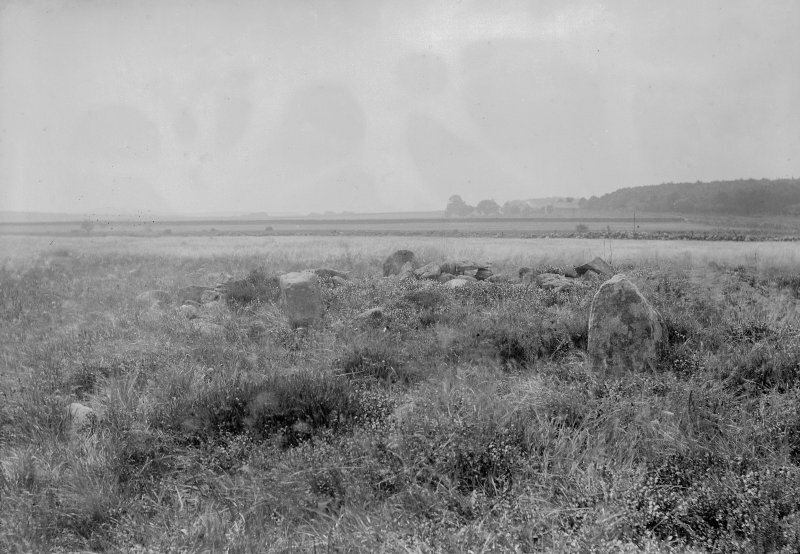 Original negative captioned: 'Stone Circle at Cairnwell near Portlethen Station looking North showing ...... [illegible] / July 1902 Stone Setting in foreground'. Name Book 1864; A Thomson 1865; F R Coles 1900; A S Henshall 1963; RCAHMS 1984, visited March 1983. NO 9071 9733 Total excavation of the scheduled Cairnwell ring-cairn (NMRS no NO99NW 4) within Badentoy park, Portlethen, Grampian was commisioned by G & J Investments Ltd in advance of future development. After excavation the monument was relocated and accurately reconstructed within a landscaped site, accessible to the public, 175m to the NW. Fieldwork and reconstruction supervision was conducted by AOC (Scotland) Ltd in January and February 1995, Scheduled monument consent was granted for the excavation of an area around the cairn, the cairn itself, the cairn mound, post-excavation analysis and publication of the project. The ring-cairn was found to have three main structural elements: the ring-cairn composed of an inner and outer kerb with rubble between; a stone circle, enclosing the ring-cairn, of which three orthostats were still in situ, one fallen orthostat was revealed and three possible stone sockets identified; and a later deposit of rubble, with an outer revetment. Beneath the ring-cairn an earlier timber enclosure with and entrance to the SE was identified. Within the interior of the site five possible cremation pits were located. Twelve pits or post holes, either underneath the ring-cairn or just outside it were also excavated. A full post-excavation and dating programme is currently under way. Archive will be deposited in NMRS. Sponsor: G & J Investments Ltd.
T Rees and J Barber 1995. 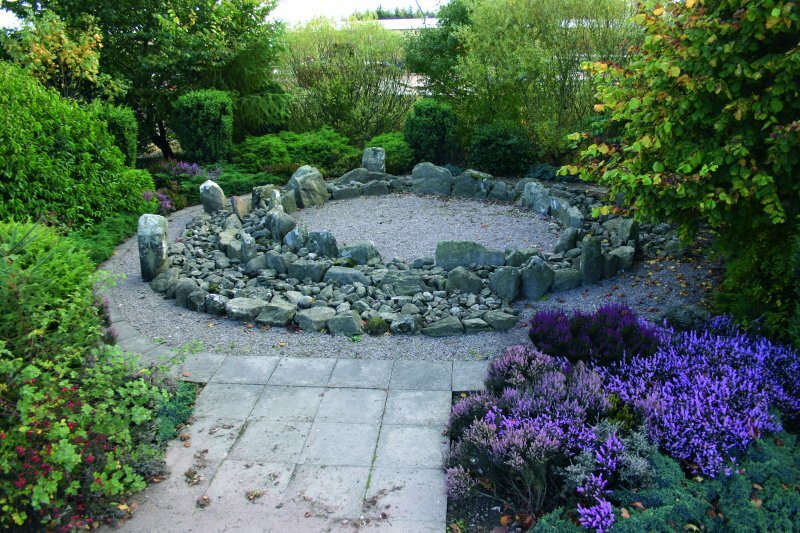 This ring-cairn and surrounding stone circle were fully excavated in 1995 in advance of development within Badentoy industrial estate, and the site was then reconstructed 175m to the NW (NJ 9063 9749). Excavation revealed an interesting sequence of activity at the site, the earliest phase being a curvilinear arrangement of six pits, one of which contained pottery, cereal grain and wood charcoal that was radiocarbon dated to 4680 ± 80 BP. The next securely dated context for human activity was radiocarbon dated to 3070 ± 60 BP, some 1600 radiocarbon years later, and was represented by an area of intense burning, interpreted as the remains of a funeral pyre. Following this, a timber enclosure was constructed within a narrow bedding trench, terminated on the S by two large post-holes flanking an entrance. A further four pits were discovered clustered around this entrance, and within the enclosure itself five cremation pits were re-identified, having been excavated previously in 1858 when fragments of urns were recorded (Thomson 1864, 132). On top of this was built the ring-cairn, measuring at least 7m in diameter overall, and defined externally by a near-continuous kerb of thirty-six stones. The internal court measured 4.2m in diameter with twenty-one surviving stones, and had been constructed on the line of the bedding trench; the area between the two kerbs was infilled with rubble. The stones of the outer kerb were mainly thin flagstones, though some larger more rounded boulders were noted on the S arc. One, which was more than twice the length of the others, straddled the entrance into the underlying enclosure. A stone circle surrounded the cairn and was the only structural component not to be radiocarbon dated. Overall it measured 9m in diameter and comprised eight stones, only three of which were still standing when the site was excavated. Of the remainder, one had fallen and was discovered beside its socket, and four had been removed and were revealed only as sockets. A revetment of rubble linked the stone circle with the outer kerb of the cairn. Thomson provides the first detailed account of the ring-cairn in 1858, giving a plan of the site as well as a written description with measurements (Thomson 1865, 131-3). Thomson shows a circle of thirteen standing stones surrounding a ring-cairn with a broad band of rubble between the kerbs and a small internal court. The overall diameter of the cairn is given as 'about 56 feet' (17m), and the internal court is said to have 'a diameter of 12 feet' (3.6m). The stone circle is 'about 12 feet distant' from the outer kerb, roughly equating with a diameter of 80 feet (24.4m). By digging the internal court, he 'found at five spots, arranged in a quincunx, fragments of coarse earthenware urns'. 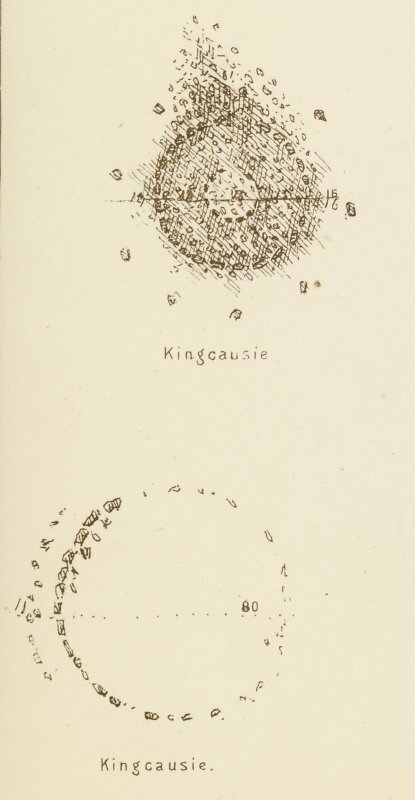 Coles' plan and account, published in 1900, shows only three stones of the circle remaining, with comparatively narrow gaps between the circle and the outer kerb, and likewise between the outer and inner kerbs of the cairn (Coles 1900, 149-52). His measurements are very different from those of Thomson, the circle being 30 feet (9.1m) in diameter and the inner court 15 feet (4.6m) in diameter. These are little different from the measurements published in Henshall's account, which in turn bear close comparison with the plan undertaken prior to excavation (Henshall 1963, 400-01; Rees 1997, 259). Indeed, had it not been for the presence of the five central pits, there is little similarity between Thomson's account and the detail revealed by excavation. Information from RCAHMS (ARG), 9 May 2006. 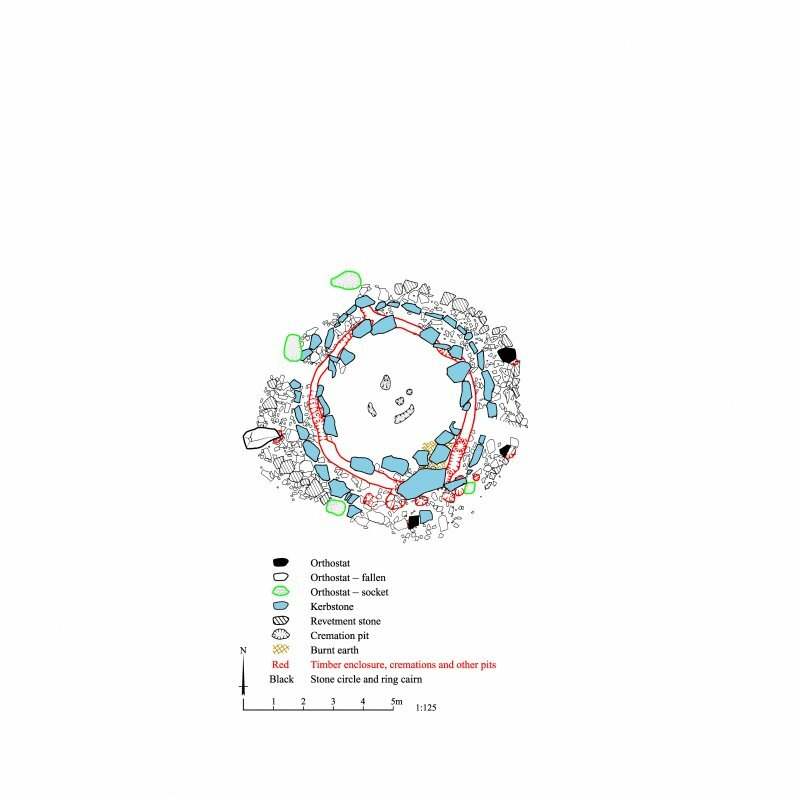 In 1995 this ring-cairn and its surrounding stone circle were fully excavated by Thomas Rees (1997) and reconstructed on a new site adjacent to the access road from the adjacent field it remained in this state until the excavation in 1995 (Henshall 1963, 400; RCAHMS 1984, 8, no. 12; Rees 1997, 255–9, 264). As disinterred, the ring-cairn measured at least 7m in diameter over a near-continuous outer kerb; for the most part this kerb was made up of thin slabs up to 0.7m high, but around the south-west it was formed of more rounded thicker boulders, and one slab on the south was 1.8m long. The internal court measured 4.2m across and the slabs of its kerb formerly stood about 1m high. Outside the outer kerb a platform of cairn material extended out to a line of larger stones following the circumference of the surrounding circle, which measured about 9m in overall diameter. To all intents and purposes, the final form of this ring-cairn and its stone circle is fairly typical of other examples contained within this volume. The excavation, however, revealed a complex sequence of activity, beginning in the Neolithic with six shallow pits set out in a semicircle some 14m in diameter. Two of these contained Neolithic pottery, and charcoal from another returned a radiocarbon date of 4680 ± 80 BP (GU–4402: 3650–3190 cal BC). The next secure context was some 1600 radiocarbon years later, comprising an area of intense burning that was interpreted as the remains of a funeral pyre and dated to 3070 ± 60 BP (GU–4399: 1515–1180 cal BC). The excavator suggested that the otherwise undated stone circle also originated in the middle Neolithic to account for the concentric position of the earlier pits in relationship to the eventual position of the ring-cairn. Be that as it may, the use of the site as a pyre heralded a series of events that are evidently closely related in time and space. The first of these was the construction of a small penannular enclosure 5.7m in overall diameter, formed of timbers set in a continuous bedding trench and terminating in two large post holes flanking the entrance on the south; a radiocarbon date of 3020 ± 70 BP (GU–4400: 1435–1035 cal BC) was returned from charcoal at the bottom of one of the terminal post-holes. Four pits set in a shallow arc outside the entrance were also sealed beneath the ring-cairn and probably belong to this phase. All contained fragments of burnt bones, though in only one could it be identified as human; in another the bones probably belonged to a large mammal, and charcoal from this pit was dated to 2970 ± 50 BP (GU–4401: 1395–1050 cal BC). On the basis of radiocarbon dates of 3020 ± 50 BP (GU–4396: 1420–1135 cal BC) and 2970 ± 50 BP (GU– 4398: 1395–1050 cal BC), the excavator also attributed the five cremation pits that were first discovered within the interior in 1858 by Thomson to this phase. While this may be the case, there is no reason stratigraphically why they should not have been deposited in the court of the ring-cairn, which references several components of the timber enclosure so closely that they are unlikely to be of substantially different dates. The inner kerb, for example, roughly followed the line of the timber wall, while the long slab in the outer kerb lay across its entrance and the kerbstones on either side were the only two in the entire circuit that were set in sockets cut into the subsoil. A radiocarbon date of 3100 ± 50 BP (GU–4396: 1515–1270 cal BC) was obtained from a buried soil containing pottery beneath the ring-cairn. The rubble platform outside the ring-cairn was clearly an addition extending out from the foot of the outer kerb to embrace the orthostats of the surrounding circle. Despite the excavators’ hypothesis that the latter was erected in the Neolithic, the registration of the stone and timber components to one another suggests that they are all very closely related, and probably constructed over a relatively short period of time. As Cairnwell was clearly a ring-cairn standing within a stone circle, Audrey Henshall included it with the two on nearby Campstone Hill, Raedykes, in her survey of the Clava group of passage graves and ring-cairns, and it has since appeared with that designation in Burl’s gazetteer and guidebooks (Burl 1976a, 360, Knc 3; 1995, 137; 2005a, 137). 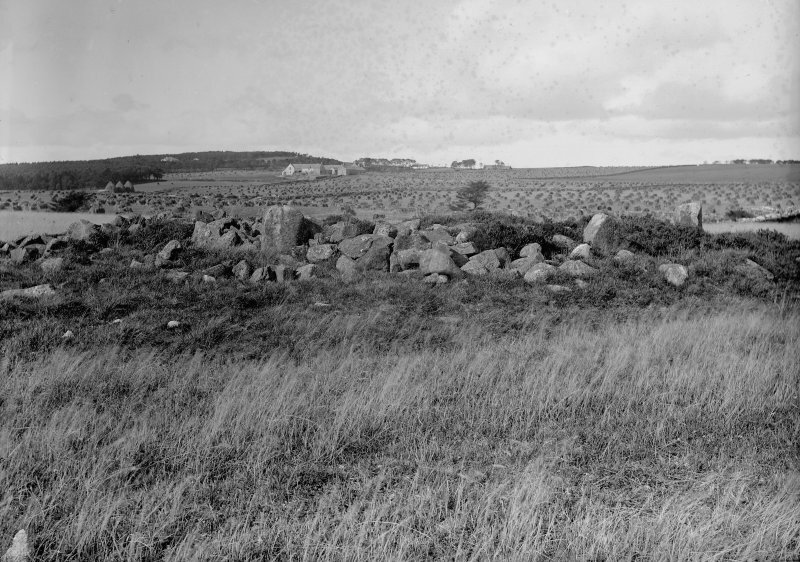 As long ago as 1972, however, James Kenworthy argued that the ring-cairns in the North-east had their own identity (1973), and Barnatt has since suggested that these three share more features in common with recumbent stone circles than with Clava cairns; in his view they are extreme recumbent stone circles, albeit that they have dispensed with the recumbent setting (1989, 96–8, 275, no. 6:21). In the light of the excavation, Burl has now listed Cairnwell as a possible recumbent stone circle (2000, 429, Knc 4). There can be no doubting the connections between the architectural features of Cairnwell and these monuments, from the use of the larger boulders in the outer kerb on the south-west through to the encircling platform. It is equally detectable in the symbolism of the long slab on the south laid across the entrance to the earlier enclosure, probably between two of the larger outer kerbstones. That said, there is no link forged between this blocked doorway and the surrounding circle in the way that is typically found in recumbent stone circles; if anything, it lies asymmetrically to the closest orthostats of the circle. In effect, there is no unison in the design that focuses from the circle to this slab in the way that is routinely presented by the monuments included in this Gazetteer as recumbent stone circles.